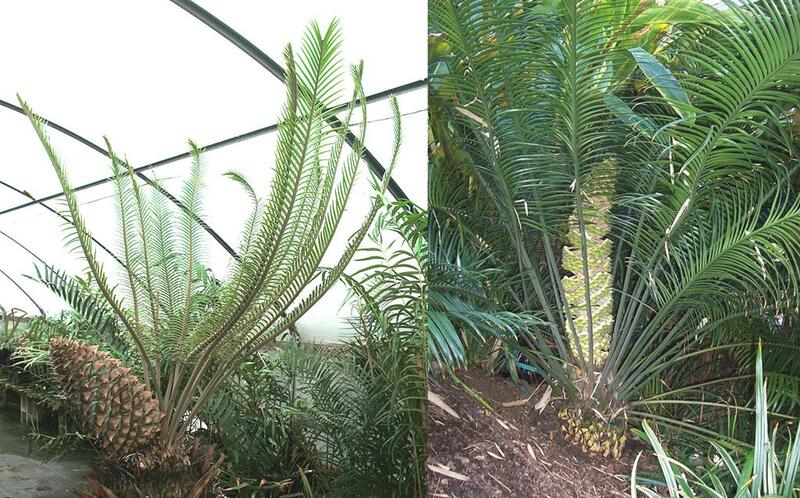 Lepidozamia plants are cycads with long feathery arching leaves and no spines that grow well in shady locations. The cycad name Lepidozamia comes from the Greek lepidos, meaning "scaly" (referring to the scalelike leaf bases) and zamia. The genus Lepidozamia only includes two species, Lepidozamia hopei and Lepidozamia peroffskyana, both from Australia..
Click here to see this image enlarged. Over the long term, Lepidozamias can grow to heights of over 50 feet, making them among the tallest known cycad plants.